This is my first post here and I thought you might be interested in the project I have just finished. My previous PC was completely fanless and water-cooled. So far so good, but since I don’t need a gaming PC I wanted to build something really puristic without all the annoying water cooling equipment. The initial idea came by reading the i5-670 CPU review here and I really liked the integrated GPU concept because you can get rid of a graphic card. No graphic card means much less power consumption, heat and noise (in the case of an actively cooled card). So I built everything around an i5-660 CPU (TDP 73W only, i.e. 10W less than an i5-670). No fans also meant that all components would have to be exposed to as much fresh air as possible. So I thought a (Mini-ITX) test bench would work much better than any PC case (=> Lian Li PC-Q06, with custom water jet cut side panels to get some air to the PSU). The passive PSU I have used is the Seasonic X-400FL (again due to the positive review here). Mainboard: Gigabyte GA-H55N-USB3, equipped with a Zalman ZM-NB32K chipset cooler being the only one that fits under the CPU heatsink (the original cooler did not look very effective to me…). 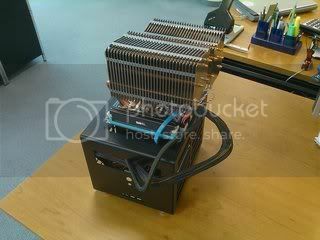 CPU heatsink: In a passive set-up you need to get enough air through the heatsink fins, i.e. you have to choose one with as much space between the fins as possible. The best and largest one I have found was the silentmaxx TwinBlock. 10 out of 10 for silence. 1 out of 10 for practicality. I don't know, having a completely silent no moving parts PC, sounds "practical" to me. I probably would have put that into a case of some sort, and maybe tried for a PICO power supply. Mainly because if you drop anything, or something magically goes flying across the room, or if anything just the right (or wrong) size comes into contact with that motherboard on top, you've got a serious problem. I know it's out in the open to make use of the natural airflow of the room, but I wouldn't risk the safety of the components for that. Dust, children, pets... depends on your circumstances I suppose. You just have to be a bit careful and place it accordingly. BTW: The hard disk is an SSD of course (Corsair Force Series F120 SSD MLC). How large is the TwinBlock compared to, say, two Ninjas? Your CPU temperatures are surprising - that must be a power-hungry CPU, but your heatsink can handle it. My fanless, caseless systems has a Ninja on the CPU (undervolted X2), and never gets above 40°C. If I could, I would put equal-sized heatsinks on my CPU and northbridge, because they probably dissipate the same amount of heat. The individual towers are actually sized almost identical to a Ninja. So it's like having to Ninjas put together and attached to the CPU. It's mainly the space between the fins that makes the difference (especially temperature-wise...). The CPU is very effective with just 73W power dissipation compared to 130W of the high performance versions of the Intel i7 processors but I do not need that much power anyway. As I said, this is not a gaming PC. The less heat you have to lead away the better. Yeah, I'd be a little worried about dropping something on it. If you're too worried about the aiflow, you could just get some screen door mesh, put it on some wood or metal frames, or get some pre-constructed window screens of a good size, and put those around it. Is there an SSD or some kind of hard drive in there? Yup, see above (Corsair Force Series F120 SSD MLC). It is located just under the mainboard in a "Kingston SSD DriveCarrier". It's cool. However, my X-400 exhibits significant buzz noise (louder than a 800rpm fan) sometimes, e.g. encounter once (last for hours) every a couple of days, even if the system is turned off. Have you ever experience similar issue? My Vertex Turbo will buzz while I load a games from it. 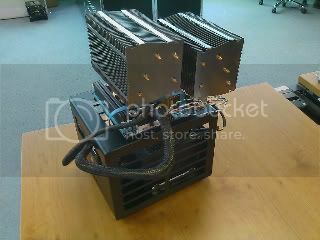 Where can you buy that heat sink? The U.S. distributor is http://www.budeso.com/ according to the silentmaxx homepage. I would actually write them an e-mail ([email protected]). I guess you can order directly from them too. That's what I call overkill! I'd still install everything inside that case, even with the side panels off. Placing the motherboard on its side will let the hot air go up, potentially improving your temperatures. BTW, any reason for you not to consider the de-facto standard for fanless computers, the Scythe Orochi? Nothing thermaltake makes is ever quiet. If they could figure out how to make a flash drive noisy, they would. By looking at the design of the Orochi you can see it was built to be used with a fan. Hi how much did this all cost? Huge mass + large fin spacing = designed for fanless use/extremely low airflow conditions, just like this enormous Silentmaxx. With a Scythe Orochi CPU cooler on it? I don't know how the fin spacing compares between the two (?) but having two SEPARATE blocks certainly works better if you don't use a fan. However, fin spacing is the key. That does look pretty cool what you built there. Concerning safety I guess it would be no problem to put that in a desk or a box. I do not know how cool or stable these systems are, though. I like it. For protection, maybe suspended in a basket made of some copper grounding wire. A hamster or bird cage might be too off the wall, unless they were ultra Victorian. Nearly eight years and going strong! 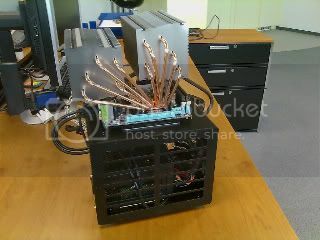 ....Antec NSK-3480, OCZ-600w PSU; Intel DH55tc 1156/mATX [pre-9/12: Asus P7H55-M] no more ASUS! ; i5-760, 2.8gb; Kingston 16gb memory (low boys); Gigabyte ATI 5870 w/ stock heatsink and fans (runs warmish); Gellid Tranquillo CPU cooler w/ Arctic Cooling PWM; case cooling fans- two Nexus 12cm RS fans at 1000 rpm. rkay, I just wander how is your PC fills after more than a year of continuous running? Were there any troubles with its parts? In summer heat? Maybe some replacements/additions, why? This sounds to me like the effect of extraneous "junk" on the AC line. A PSU that is turned off should make no noise. Consider what else you have plugged in and working on the same AC circuit. AC signal quality can vary a lot, from house to house, city to city, etc. You might try some kind of AC filter or line conditioner -- or even just a different AC outlet.